Doors have the ability to totally transform both kitchens & bedrooms alike. Regardless of whether your customer lives in an expansive farmhouse or a pokey new-build, our new door range has something to suit. The range marries quality & choice, offering over 100 separate door designs with over 50 different finishes & colours. The sheer size of the range allows your customers to define their individual tastes & put their personal stamp on their living space. They simply select the style, finish & colour to enhance their space. One trend that is set to be huge, is handleless doors (yes, doors without handles!). Doing away with handles all together and using a J Pull system. This is perfect for people wanting to take the minimalist trend to the max! The exciting new Gallo door range (seen above) brings together elements of pragmatism with quintessential design. 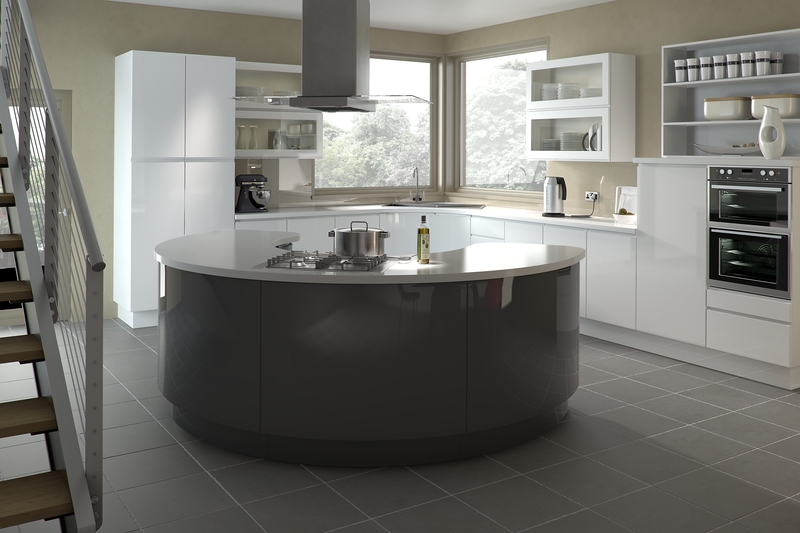 Angular functional cabinets in gloss white are combined with the stunning arched island in gloss anthracite; making this kitchen the epitome of style & functional flair. Request a catalogue today & discover everything this new range has to offer, including curved, painted doors & inframe doors. Ring 0845 634 9700 or email sales@nesp.co.uk today.